Size: S (36″) – 4XL (48″). 6 Button and adjustable waist. 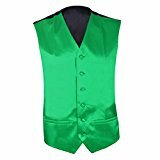 Perfect waistcoat to accessorise with any men’s suit at a party, at a wedding, a function or even. Package contents: 1 x Wedding Waistcoat Men Waistcoat.